There was a time when the dinner roll was ubiquitous fare with evening meals throughout America. In the early half of the 20th century, most popular was the Parker House roll, that fluffy darling known for its addictive sweetness. The cloverleaf roll and other flavorless knock-offs followed, and by the 70’s and 80’s the dinner roll had morphed into throw-away status, a mere place-holder for the most ravenous. Before we knew it, our evening bread threatened to drift into obscurity. For those conforming to diets and health regimens, the dinner roll was typically viewed as not worth the carb outlay and restaurateurs were forced to take a serious look at the role bread played on the plate. They recognized the value of bread: it bought time and was an affordable meal extender. On the other side, diners’ palates were becoming more sophisticated. “Either give us something worth eating, or forget about it,” they demanded. Enter the army of artisan breads. Apparently, the French knew what they were doing with their beloved baguette. It wasn’t long before delightfully innovative loaves had fully captured our attention and claimed a well-deserved place at the table. We made the turn from soft and fluffy dinner rolls to artfully crafted bread—worth eating every crunchy, chewy, tangy bite. Me? I’m somewhere in the middle. I enjoy a slice of crusty bread dipped in flavored olive oil. Currently on my counter? I’ve got my own light, yeasty rolls cooling on a rack; they’re enriched with sweet potato, accented by fresh sage. Shades of Parker House rolls! These slightly sweet copper-tinged beauties serve a dual purpose: they are both nutritious and delicious. The sweet potato provides a good hit of valuable nutrients like vitamins A, C, manganese, calcium and iron, plus it brings a touch of sweetness and adds fiber for the dough’s structure. This particular recipe is actually reworked from a gluten-free one by Erin McKenna in her excellent cookbook, Bread & Butter. In my version, the dough is quickly mixed by hand to bring the dry and wet ingredients together. I use instant dry yeast which cuts down on rising time. Best news here, no kneading is required. The scooped dough is dropped onto a baking pan with limited space between the rolls. Within the hour they double in size, ready for the oven where they rise up and support each other to form light pull-apart rolls. These rolls have real character; they are a match with a simple smear of butter and they can stand up to big flavors. 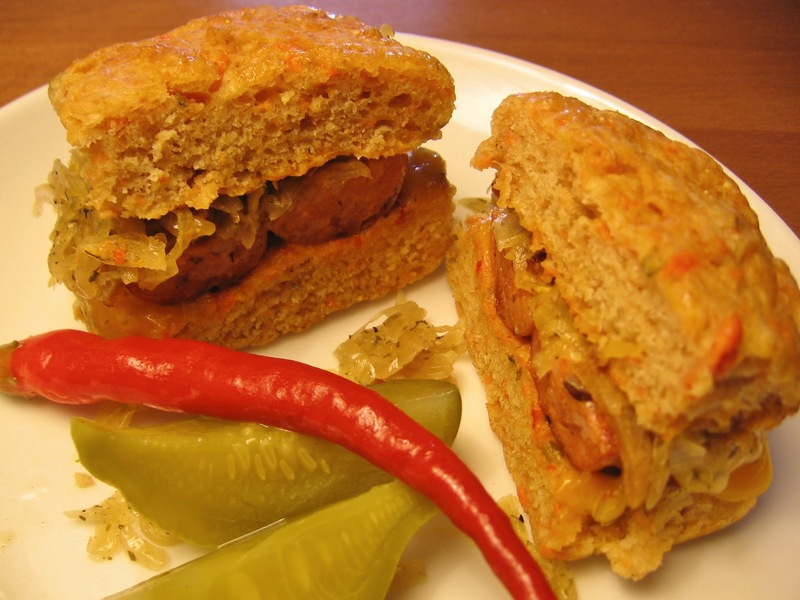 I’ve used them as sliders with sausage, kraut, and spicy mustard. They are perfect for breakfast with eggs and such. They are just right with minestrone soup, and the dough makes fantastic pizza! You get the idea, they are dinner rolls worth eating. Ahead: Prepare the sweet potato puree: bake 1 small for 6-8 minutes in microwave, turning once half way through. Let cool, scoop out the pulp, mash it well, and reserve ½ cup for puree. Butter the sides of 8×8” or 9×12” baking pan, line the bottom with parchment, sprinkle with cornmeal. In medium bowl whisk together flours, instant yeast, baking powder and salt. In a 2 cup measure or small bowl, combine the puree, 1 tablespoon butter, milk, agave, sage, and warm for 40-60 seconds in microwave to melt butter and bring it to 110-120°. Make a well in the dry and pour in the liquid; with a spatula stir to combine, until it is the consistency of a sticky dough. Using a 3-tablespoon ice cream scoop, measure portions into pan with no more than 1/2 inch between each roll on the pan. Cover the pan with a towel and let the rolls rise until light, 45-60 minutes. Preheat the oven to 400°F. Bake the rolls for about 16 minutes–half way through rotate the pan. Bake until golden and a toothpick inserted in the center comes out clean. Let the rolls cool on rack for 10 minutes before unmolding. Yield: 9-12 rolls. Previous: Previous post: Surprise! Surprise!